at the Jewish Museum of Maryland from April 8 – May 28, 2018. Primary sources are powerful tools for understanding the world we live in. In a nation where public discourse is often reduced to squabbling among silos of contending pundits, what could be more critical to improving our understanding of both history and the present than the reintroduction of the original records of people and events. There is no greater repository of records than The National Archives and Records Administration (NARA). In Spring 2018 the Jewish Museum of Maryland will host a special exhibit developed by the National Archives which will inspire dialogue and conversation on constitutional law and civil rights. On the 225th anniversary of the Bill of Rights, National Archives created this exhibit to both honor that milestone and serve as a tool for encouraging thoughtful debate and discussion of how our ancestors sought to create a more just society and how we do so today. Using the rich sources available in NARA’s holdings, including records from the Constitutional Convention, Office of War Information, U.S. Senate, presidential libraries and others, this exhibit examines the process codified by our nation’s founding fathers for changing the U.S. Constitution and explores the various amendments that have been proposed over the course of more than two centuries. The exhibit highlights the unique nature of American government which allows its citizens to adapt and adjust legislation through the power of the amendment process. Viewing facsimiles of these original records, visitors will realize that many of the debates that dominate our news today were very contentious issues more than two centuries ago. 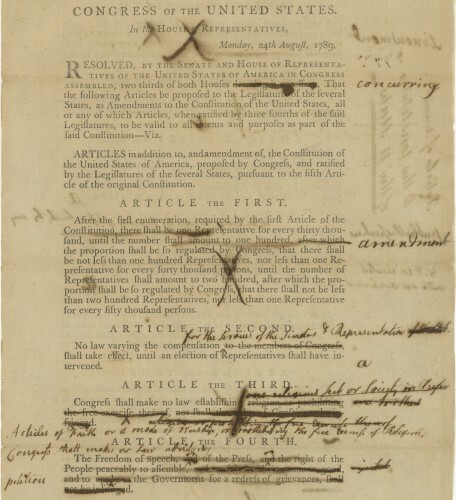 Cross-outs on Senate mark-up version of the Bill of Rights (Aug 24, 1789) demonstrate that the phrasing was contentious. It is possible to amend the Constitution, but it’s not easy. Only 27 times – out of more than 11,000 tries – have Americans reached consensus to amend the Constitution. 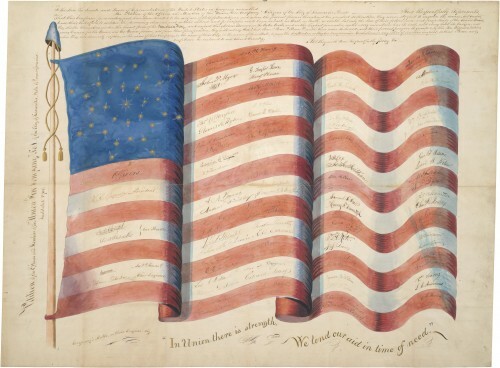 Amending America explores the history of constitutional amendments through petitions, landmark documents, political cartoons and interactive stations that address such issues as child labor, prayer in school, free speech, women’s rights, civil rights and more. Beginning with the 1791 ratification of the Bill of Rights – the first 10 constitutional amendments – the exhibit documents the arduous process by which an amendment proposal becomes law. Highlighting such landmarks as the 13th amendment that abolished slavery and the 19th amendment that gave women the right to vote, Amending America provides visitors with opportunities to reflect on how governmental policies and societal attitudes have been shaped through the amendment process. This exhibition was created by the National Archives and Records Administration, Washington, D.C. The national tour is presented in part by AT&T, History, Seedlings Foundation, and the National Archives Foundation. The Baltimore installation of Amending America is made possible through the generous support of our lead sponsor, The Herbert Bearman Foundation. Petition from the Union Fire Company No. 1, Received by Congress on February 6, 1861. Records of the United States Senate.